16-piece dragonfly dinnerware set includes 4 of each wheel thrown stoneware 10-11" dinner plates with dragonfly, 6-7" salad/dessert plates, 6-7" x 2-3" bowls, 14-16 oz mug with dragonfly. 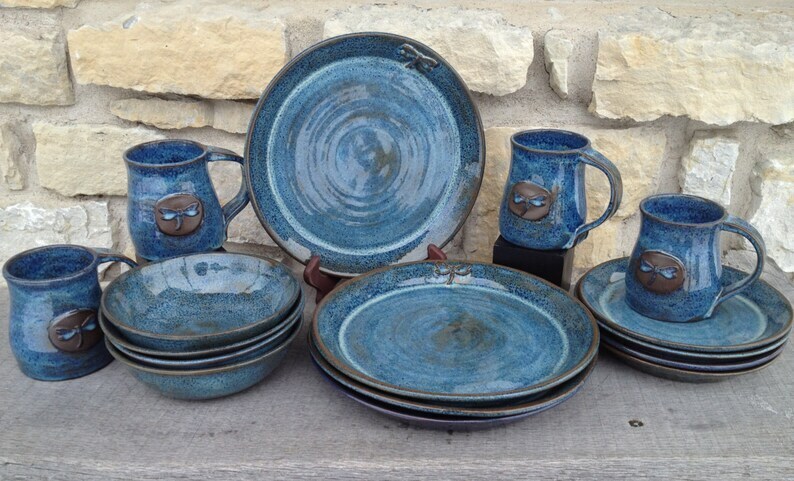 Glazed in Rutile Blue over dark clay, this dinnerware set will be a pleasure to use for years to come! All pieces are wheel thrown, trimmed, signed, glazed, and fired to cone 6 by me! The dark clay below breaks through the glazing to create earthy tones of blues and browns. Each piece will be unique. I am GAGA for my dishes. These are so perfect for my home and decor. The bowls are big enough to make my cereal bowl snob husband happy! The color, the style, PERFECT! Really lovely pottery, very heavy duty. Will be purchasing more!